I just got home from a lovely brunch on a wonderful Saturday and couldn't wait to get on to my laptop and just type this out. 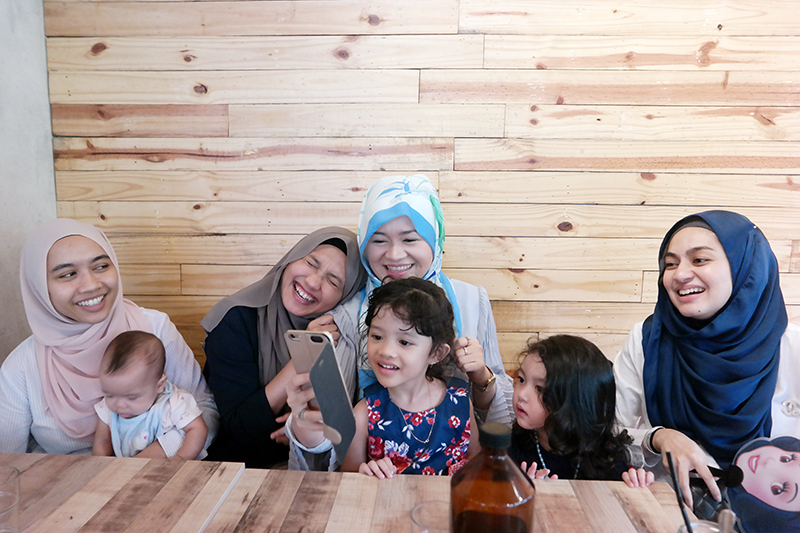 I realise that I rarely write spontaneous blog posts recently, but I just felt like blogging about my day today after meeting up with my beloved bestfriends. 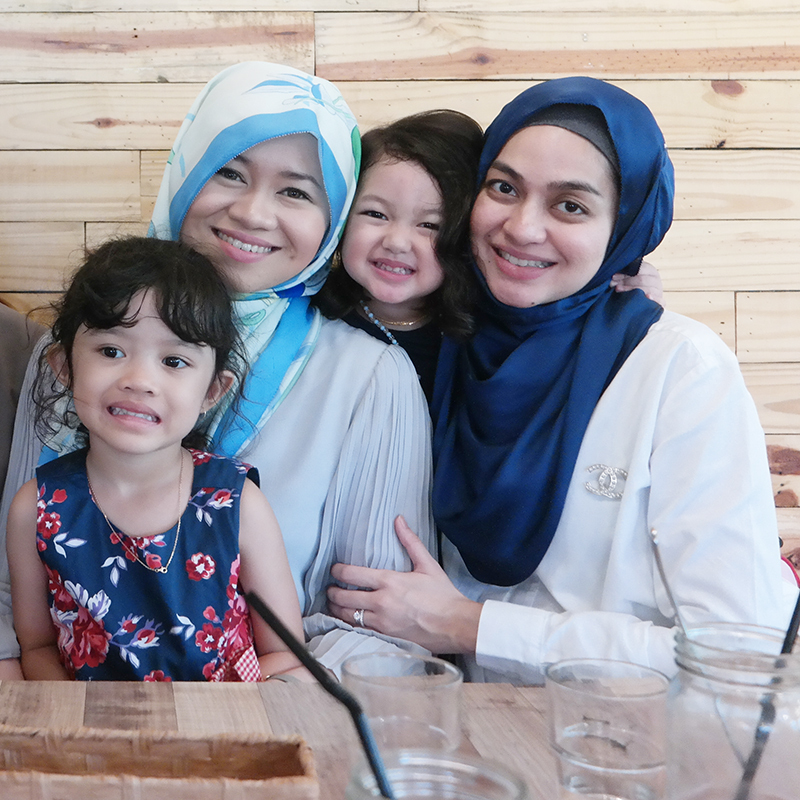 Earlier in the week, my good friend Shereen messaged us in our "For Jibrael" whatsapp group saying that she wanted to meet us this weekend since we haven't met in such a long time, and after a few cancelled meet-ups recently, we decided to just go, the four of us, to brunch today. Sanah, Eima, Shereen and I. :D Ruzana and Sarah couldn't make it today because of work obligations. 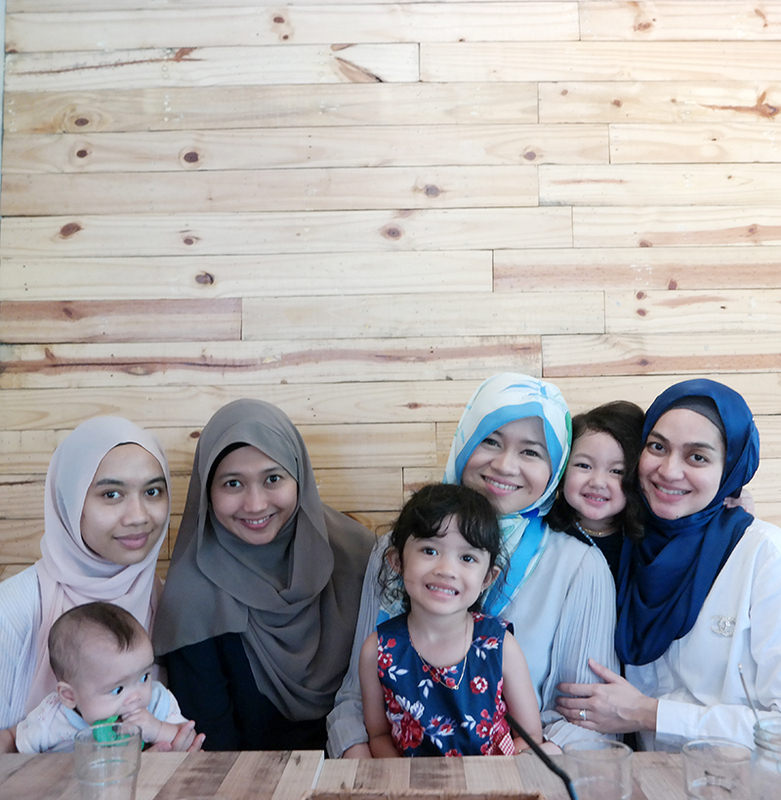 The kids, Qadriyya, Hannah and Adeena were all there too. Oh, and Shereen's baby in the tummy! Hehe. Basically, when I was in the hospital carrying Jibrael 3 years ago this whatsapp group was formed. Of course these ladies are my sisters and my high school sweethearts but during that period when I was in the hospital for 78 days, this was the place where they received updates from me or the husband on my condition, they gave me their recent updates, joked around to keep my spirits up, and where they informed me when they're coming to visit, or told me what kind of food they were bringing for me, air zamzam (water), prayers or just to accompany me at the hospital. Of course, Khubayb was there everyday and my parents/family were there almost every day but when they were not there, there are times these sisters of mine were there to accompany me. At times, there were no one else except me, Jibrael and the hospital doctors and nurses. But spending time with my baby, I never felt lonely. And of course I was reminded again and again at that time, we are never alone as God, out Creator is always there for us. Anyway, we basically updated each other through that group when I was at the hospital for quite a long time. So far, this is the only group that stuck from that period. Khubayb and I had a few other groups at the time with Jibrael's name but I guess some people felt uncomfortable and awkward after Jibrael passed away so they would rather leave the group and create new ones. Sometimes I feel it's so weird that others can be uncomfortable at the thought of my daughter's passing when in fact, I'm the one who's going though the death of my own child. But, I guess that is the nature of life. If it was me in other people's shoes, I might feel the same way too, I suppose. 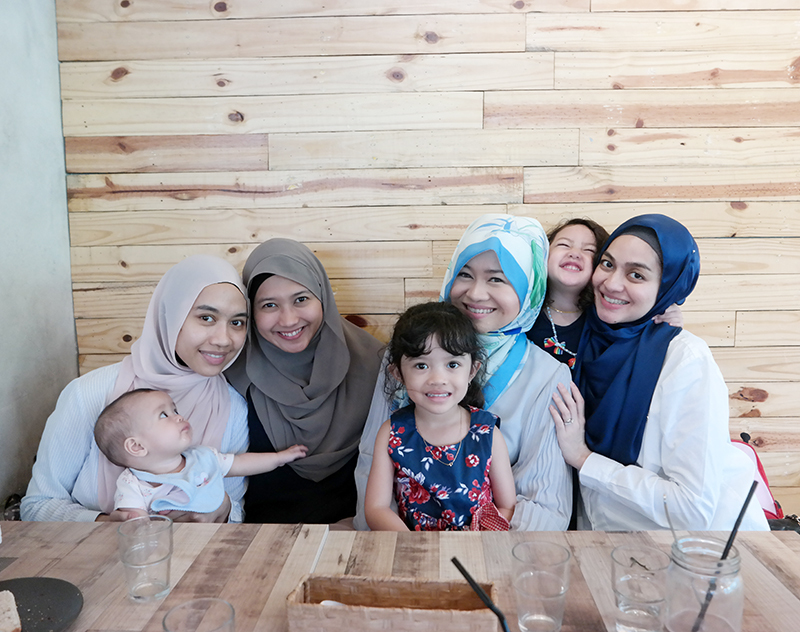 It's easy to find friends who will be with you during good times but these sisters of mine were there during the hardest of times and for that I'm extremely blessed and thankful to have known them since high school (some since Standard 1). Our friendship has blossomed into sisterhood. Alhamdulillah. There are times that we don't get to meet each other for months because of the situation that we are in (work or family) but when we meet it's as though we were never separated. That's why I'm also thankful for today's technology, where you can have Whatsapp Groups and update each other even when you can't meet. I wasn't well for a long time end of last year but on my birthday last year they came to me and brought food and surprises which cheered me up while I was lying down almost the whole time. When we have grown to be more matured, we have different responsibilities and obligations towards family, career, job, spouse, family and kids. 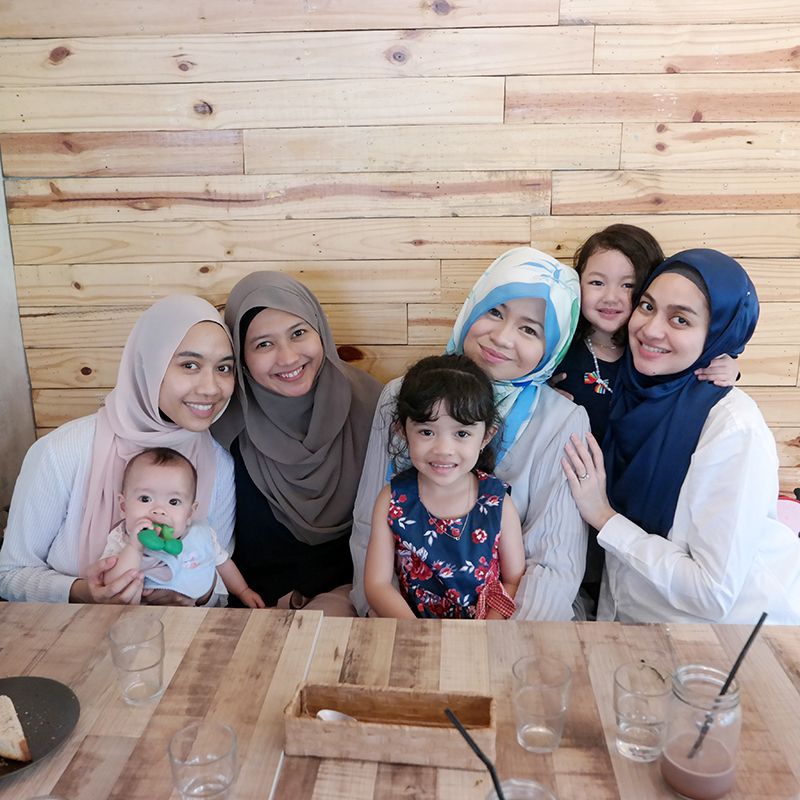 But I realise that we always have to make an effort to meet up with friends especially the ones who has been with us through thick and thin and we have grown up together. They are the same ones who you're comfortable with, advise you when needed, randomly checks up on you, reminds you when you forget, happy and proud of you when you achieve and do something good, scold you when you do something wrong, cheer you up when you're down, makes you happy, lend a shoulder to cry on, who makes you laugh at silly jokes, share clothes with, have seen you at your worst and ugliest, be there when you need them, care about you when you're sick or not okay, listen to you when you need them to, reminds you of what you have become and how much you've grown and many many more. I love you guys so very much. I'm grateful for the sisterhood. I pray that Allah will keep our friendship till we're all wrinkly with our grandchildren and grand grandchildren. May Allah reunite us in heaven. For staying in this group I pray that JIbrael will also pray for you all too from heaven and reward you for your kindness during our fight that 3 years ago and may we all reside in heaven in the Afterlife together with our family. One sweet day. Triple OOTD with Shereen and Hannah. my aere RAYNA Reversible Pleated Sleeves Top. Pregger Mama Shereen, giving birth in a few months time InsyaAllah. May Allah make it easy and beautiful. Teaching Qadriyya how to Snpachat. Apparently making silly funny faces can be a really serious matter. Hehe. Also wrote about my loves in What Sisters Are For 1 and The Ones Who Keep Me Up.